This is an excellent way to enjoy a super healthy, high-protein, vegan, gluten-free meal, whilst using optimal plant-based ingredients. Works wonders with a salad or potato wedges; or in a bap with salad/sauce toppings. This recipe works especially well under a grill (broiler in the USA). Grilling in this way keeps it pleasantly moist on the inside with a lovely soft crisp on the outside; so that you can enjoy it with OR without the addition of a sauce. If you fancy a sauce with it then try it with my Fresh ginger Tomato Sauce or this delicious creamy Tahini Coriander Sauce. They both work a treat here. To be honest, when I first created this recipe years ago, I never had sauce with it – just felt so whole and complete on its own. That said, at this current time, I am really loving my sauces with it – a sort of amazing feast for all of the senses. It works wonders in a bun with sauce or ketchup; with potato wedges or veggies. Chickpeas (garbonzo beans) are the star of the show in this recipe. They are a little treasure trove of nutritional goodness, with high levels of protein, plenty of phytonutrients, folates and an abundance of minerals such as manganese, iron, copper, phosphorous and zinc. Rosemary is helps to bring it all together. Rosemary is a highly aromatic, pungent herb that grows in temperate or Mediterranean climates in abundance. I always have several plants growing in my garden and pick it freely throughout the year. I absolutely love it. Rosemary is known to be beneficial against adrenal fatigue, circulatory disorders, helps memory and concentration whilst acting as an anti-fungal, anti-oxidant, anti-inflammatory and anti-stress herb. This recipe is another great way that we can include it in our regular diet for wonderful taste and health support. 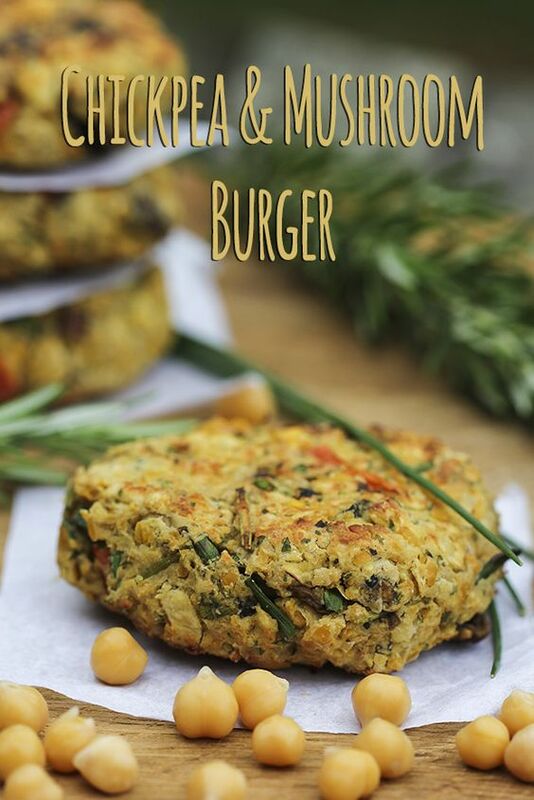 We absolutely love this highly nutritious veggie burger here and hope that you enjoy it too. This recipe is from my book Angelicious. Click here to check it out. Hi Trinity, I couldn’t get hold of gram or besan flour. Would it be ok to use Quinou flour? Thanks. Looking forward to eating these….they look yum. I would certainly give it a go. Quinoa flour or coconut flour would probably work fine. OK – thank you for sharing. I do know that gram flour is extra absorbent, so perhaps it’s more essential that I thought. The burgers are meant to be moist on the inside (but not wet 🙂 )… and firm on the outside. I use a gas grill. I imagine if you use an electric one it would take longer or have different results too. Would work great fried, I imagine. I’ve just discovered your recipes! I’m excited to make the burgers! I will make them next week along with the chocolates! Wonderful. Try the falafels too! Ahhhhw I am so sorry to hear this Phil. Without watching what you are doing, it’s hard to say what might be going wrong. This burger should hold together really well if you make it exactly as written. The natural moisture of the chickpeas and tahini added with the gram flour are designed to pull this all together. Be sure that your chickpeas are mashed enough too. It’s fine to have some rustic chunks in there, although you need to mash them down enough to create bind-ability. Be sure to compress the mixture firmly too. I use Bob’s egg replacer and you only need a tablespoon for it to work with 3 tablespoons of water.It holds everything together like glue but is made from all natural good for you vegan ingredients.. Wonderful! I am delighted to hear it. Sweet potato mash and salad sounds like a perfect addition. I would have to whizz up in machine as my hands will not do this. I find it all goes well with a gadget nowadays. What do you think to sticky millet popped in too, for the holding purposes? Thank you Kushi – pleased to hear it. You are very welcome Sally – I am so pleased that you enjoy this recipe. I have chives, lovage and sage in my garden too – what an excellent idea. Hi Trinity, thanks for the inspiring recipe. I made this burger today, I just changed the recipe a little bit 🙂 instead of the mushurooms I added aubergine and courgette. Just delicious. Thank you. Love your page. I love the sound of your variation and am so pleased to hear that you made this. Hi! Looking for some easy foods to take on a week-long camping trip. Do these keep well? I’d pre-cook them and keep them in a cooler. Have you tried freezing them? How long would you say they’re good for in a fridge? 🙂 cheers! I followed the instructions and the burgers held together perfectly when grilled, nice and crispy on the outside and moist inside, delicious! Delighted to hear that Cheeta! Welcome to my website. Thank you for your comment and instagram post – just off to check that out now. Ahhw well it would be a different recipe with butter beans and buckwheat flour to be honest… not sure I would do it like that myself ? Hi Trinity, thanks or sharing this; just finished making these and they were lovely. I got carried away when preparing and absent mindedly mixed my mushrooms into the mixture before cooking as was instructed, I also substituted a normal onion for a red one as that’s what I had, I’m sure both might have enhanced the flavour but I really enjoyed them anyway. The consistency was good, not too wet at all and held together well through cooking. I will be trying these out again soon. Wonderful – thanks for dropping by with your update. Thank you for this nutritious recipe Trinity. I just made it, and just like some other ladies, I added chopped pepper to the sautéed ingredients, as well as chopped celery leaves and flat leaf parsley. I did not have gram flour but I substituted ground flax seed. I doubled the recipe and to that, I dissolved 3 Tbsp of ground flax seeds to 8 Tbsp of water. I let it stand while preparing the other ingredients and the patties turned out just right. I turned my oven to “Roast” and roasted them at 300F for 30 minutes, without turning. I let them cool down before removing from sheet. I greased the sheet with olive oil and I also coated the patties lightly with it before the roasting. For my first time trying a veggie burger. This is delicious. Wonderful – thanks for dropping by with your feedback too – always great to know. Wonderful – great idea to add extra apple for the moisture to replace the tahini. We have just had these for our tea, and they were delicious! They were a bit wet, but frying them in coconut oil worked a treat. Just one thing, we didn’t fancy the addition of apple so left it out. Oh fab – pleased to hear they worked well Angela. I know that people often fry these to good effect – wonderful. Hi! Trying your burgers for the first time tonight. They had a good consistency until I added the diced tomato, and then they got a bit wet. But I molded them into four burgers, and put them on a grill pan, in the oven under the broiler, 8 minutes per side. They didn’t really turn out under the broiler, so I put them in a pan with a little olive oil, and they turned out great!! Made thes for the first time last night … just had another for lunch … SOOOOOO very good!!! The flavors !!!!! had fresh rosemary … love what it does to the flavor. I recommend this one for a vegan burger!!! Wonderful! Happy to hear it Bernadette. I made these last night and served on potato bread buns with avocado. They were delicious and almost creamy on the inside. Wonderful – I am happy to hear that. I love the sub too – sounds perfect.